When it comes to collaboration and teamwork, your planner’s accessibility could make or break your plans. In Ganttic, it goes beyond providing access to users. What Ganttic also offers is the chance to customise each user’s default view, their reach and rights to view, edit or add each resource. For example, you can let your intern view and add his or her resource row only, while letting your staff view, edit and add all resources for management purposes. In the top right corner of the planner, click on the icon of a person. In the dropdown, click on 'Users'. A tab will appear beside your existing tab. Here, you have your entire list of users who have been invited to use your planner. 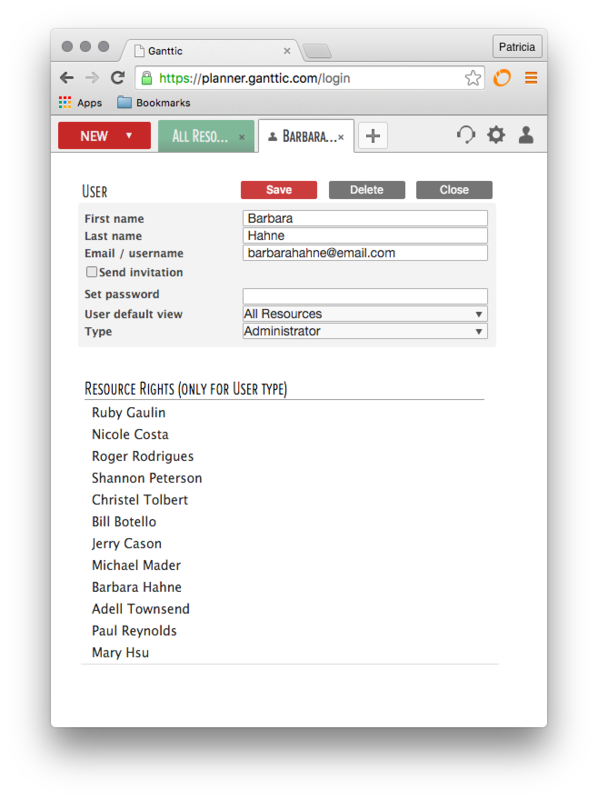 The list shows the users' names, their e-mail addresses and their roles. 'A' stands for 'administrator' while 'U' stands for 'user. Click into any user in the list. A new tab will appear showing the details of the user that you clicked into. Administrators have full access to all data, so to assign partial accessbility to a user, you would have to change their 'Type'. To change from an administrator to a user, click on the dropdown beside 'Type', and select 'User'. Once you have changed the user type, there will be some instant changes. Below the user type option will appear two other option dropdowns. And in the resource list below, there will be three icons beside each resource. When the icons are black, it means that that is the default permission. You can overwrite it by clicking on another icon and your selection will turn green. Grey icons are not activated. By selecting the first icon (stop icon) beside a resource, the user would not be able to view any of that resource's data. The second icon (eye icon) allows the user to only view the resource's plans. The third icon (pen icon) lets the user not only view, but also edit the resource's plans. Alternatively, if you click on the 'Default resource permissions' dropdown, you can give this user three general permission options. As seen below, once the 'Default resource permissions' has been changed, the icons highlights change too. You can also assign a default views to each user. The 'User Default View' dropdown offers for your resources to be sorted by your 'Resource Grouping'. To add or edit your resource custom fields, you would need to go back to your planner and make the changes there. This post introduces resource grouping. If you would like to assign different resource rights for your user, simply click on the permission icons to overwrite the default permissions. 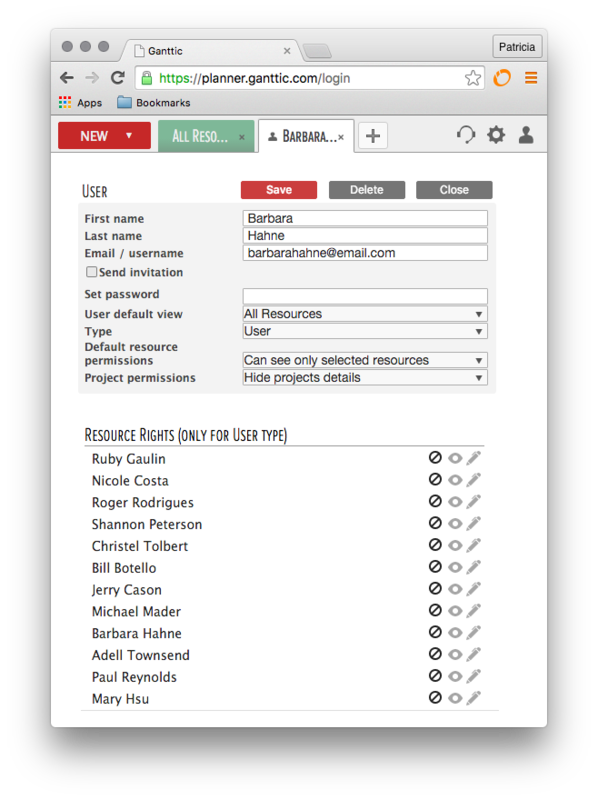 Finally, click on the 'Project permissions' dropdown if you would like to assign the user something different. When you have finished customizing the permissions, click on 'Save' to save your changes. Sign up here for a free Ganttic account if you would like to give this a try but don't have an account yet.